A Winnipeg mother who fought for her son to receive full military honours after his suicide will lay a wreath at the base of the National War Memorial this Remembrance Day, on behalf of all military mothers who have lost a child to war. Anita Cenerini is the 2018 National Silver Cross mother, an honour given by the Royal Canadian Legion. This is the first time the legion has chosen a mother who lost a child to suicide for the year-long designation. "Our country has to be ready to receive these truths about all of these soldiers," said Cenerini. Her son, Pte. Thomas Welch, served in Afghanistan in 2003. 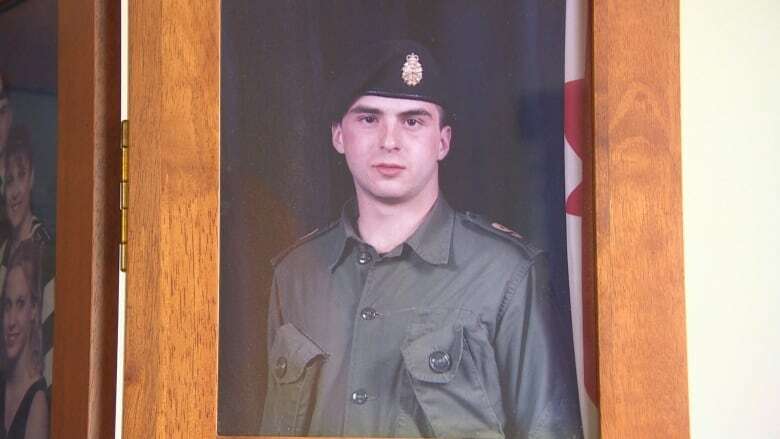 The 22-year-old ended his life on May 8, 2004, at the army base in Petawawa, Ont. He was the first Canadian soldier to take his own life upon returning from Afghanistan, according to a Globe and Mail investigation. "The legion feels it is so very important to recognize that not all service related injuries are visible," said the Royal Canadian Legion's Steven Clark, who is the director of Canada's national Remembrance Day ceremony. "We have to break down that stigma. It isn't a career-ending move to identify the fact that perhaps you are suffering from an operational stress injury." Welch's death was deemed not connected to service, a decision Cenerini said was made by the military just six days after it happened. She said her son was given a proper military funeral, but the Memorial Cross, given to families after soldiers die as a result of service, was not awarded, and his name was not added to the Book of Remembrance, which records the names of soldiers who have died in service of their country. "Thomas being a soldier, and one we were so proud of, who fought so courageously — to have his death muffled or silenced, not recognized … places the family in a difficult position, in isolation," she said. Cenerini maintained her son's suicide was connected to his tour in Afghanistan. She said it was just months after his deployment in 2003 that she started to see changes in him. The once-jovial prankster had become agitated and removed. She said she started reading up on post-traumatic stress disorder and encouraged her son to talk to someone. "I was just a mom with a little bit of book knowledge about something that I really knew nothing about," she said. "But I knew that the son who I knew was no longer the son I was speaking to on the phone. He was a completely different person, in pain and suffering." She said her son never got help and never received a formal diagnosis. It was only after an in-depth investigation by the Globe and Mail that the government took another look at her son's cause of death, she said. After 13 years of fighting, Welch's death was reclassified in September 2017. He was given the Memorial Cross and his name was added to the Book of Remembrance. Welch joined the Canadian Forces in 2001, shortly after he graduated from high school in Ontario. He wanted to become a police officer and decided three years of military service would help him get into the police academy. A month after he enlisted, the Sept. 11 attacks in the U.S. happened. Cenerini said she was watching 9/11 unfold on television with her son, when he told her he would have to go to war. She cried and asked him to leave the military, she said. "Thomas walked over to me and he put his arm around me and he said, 'Mom, they're going to need me more now than ever,'" she recalled. He was deployed to Afghanistan in the summer of 2003. Cenerini said she and her husband, Grant, got married just days before Welch flew out. She said in pictures from that day, her son is happy. The photos from months later, when he was home on leave for Thanksgiving, show a different man. "That's when we all, as a family, noticed changes in Thomas … mostly agitated, sleeplessness," she said. "It was difficult for him to be around his family, which was so contrary to life with Thomas before." Things got progressively worse over the next few months and came to a head in January, she said. Her son called, distraught after his troop mate Cpl. Jamie Murphy was killed in action. "[Thomas] was supposed to be on patrol that day but something got switched," she said. Both Murphy and her son were rear gunners. "He just kept saying it over and over and over … 'It was supposed to be me, Mom, it was supposed to be me.'" She said her son's tour ended weeks later and he was debriefed, but didn't receive any further help to deal with what he saw in battle. Welch's three-year contract was winding down and Cenerini said her son's transition out of service was anything but smooth. "He was so lost … so confused," she said. "I would ask him, 'Thomas, you're not going to do anything to hurt yourself, right?' He'd say, 'No, Mom.'" She said she encouraged her son to seek help, but he told her there was nothing to help him. He took his own life three months after returning home from Afghanistan. Cenerini said after his death was reclassified, her family received support services and she started inquiring about what was available to her son at the time. "It's to corroborate Thomas's story, where he says there was nothing — and there really was almost nothing," she said. In 2016, the Royal Canadian Legion created a new section to help veterans who are dealing with operational stress injuries, or OSIs. The Royal Ottawa Mental Health Centre defines OSIs as "any persistent psychological difficulty resulting from operational duties performed while serving in the Canadian Armed Forces or as a member of the Royal Canadian Mounted Police." Clark said the legion has representatives across the country trained to help those with a stress injury, "many of whom have been affected themselves," he said. "They know what the process is, they know how individual soldiers are affected, they — through their peer counselling — are ideal individuals to help those soldiers get the care they actually require." Helping battle PTSD priority of Royal Canadian Legion president from N.L. He said there is still a long way to go when it comes to breaking down the stigma around mental health, including post-traumatic stress disorder connected with military service. "OSI is talked about openly by those in the medical profession," he said. "It is not talked about openly by those who are suffering, and that's the stigma we have to get around." Clark said the legion hopes that naming Cenerini the Silver Cross mother will encourage veterans, soldiers and their families to reach out for help. "If we achieve a goal of bringing awareness that not all [injuries] are visible injuries, then that will help as well for those who are currently suffering." If you're experiencing suicidal thoughts or having a mental health crisis, there is help out there. ​​​For an emergency or crisis situation, call 911. You can find out more about the Royal Canadian Legion's occupational stress injury supports and resources here, or call the Veterans Affairs Canada crisis help line 24 hours a day, seven days a week at 1-800-268-7708. You can also contact the Manitoba Suicide Line toll-free at 1-877-435-7170 (1-877-HELP170) or the Kids Help Phone at 1-800-688-6868.